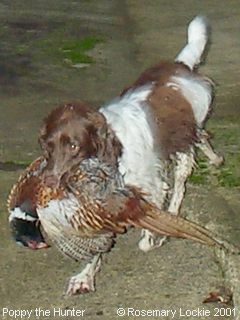 Taking the Victory Lap - Poppy, with the Late Mr. Pheasant. Prancing round with her “trophy” - the Victory Lap - a bit further round the circuit. Poppy has also caught a squirrel, several other pheasants, and rabbits, some of which I was able to retrieve and return to the wild before she frightened them to death. 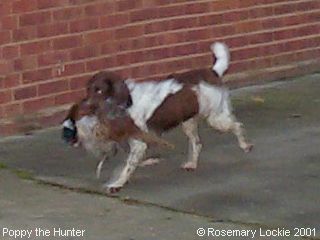 She also caught a mouse, which I tried to retrieve, but the mouse bit me! A fatal move on the mouse's part, as I might have tried a bit harder to save it otherwise!